Rest easy, and get a better night&apos;s sleep with the Miracle Bamboo Pillow. Rest easy, and get a better night&apos;s sleep with the Queen size Miracle Bamboo Pillow - the only pillow that hugs you back! If you have problems sleeping or often awake with a stiff neck, it could be that you are not getting proper support from your pillow. Keep your spine aligned with this super soft, ultra-comfortable head supporter. 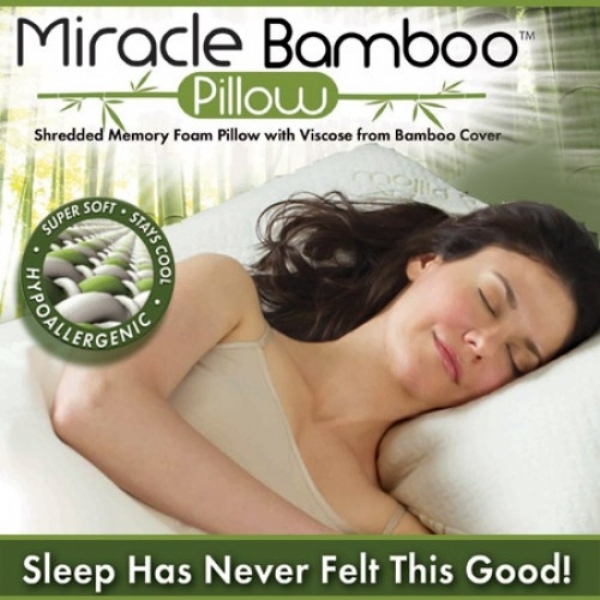 As seen on TV, the pillowcase of the Miracle Bamboo Pillow is made from the viscose of bamboo, with a durable memory foam core that offers a perfect blend of softness and support. You can lay the Miracle Bamboo Pillow flat for gentle, cradling support or flip it on its side for a softer, more fluffy support. Fold the pillow in half for a bolster support that is ideal for reading or watching television. This versatile, long-lasting pillow is a must-have to improve your nightly rest. Details: Viscose of bamboo outer covering, Adjustable support, Anti-static, Minimizes Odors, Washer and Dryer safe. These pillows are just as good as others claim. I have neck and shoulder aches when I lay down, from a lifetime of sleeping on my side. I had been taking ibuprofen to fall asleep by deadening the pain. With this pillow, I sleep well with very minor pain and no ibuprofen. But it gets even more remarkable. I have a friend staying in my house until the closing of his. Hechas major back pain, due to the disks between his vertebrae disintegrating. I bought two pillows, one to keep as a spare. I lent it to him. He won&apos;t return it and has given me money to buy another! Really decent pillow but you need to consider price point. I paid $20 at Ross and thats not much more than any other pillow. Like the size at 20x30. Not meant for travel as its pretty big and heavy. Its plenty soft especially compared to a firm pillow that kills my ear. Would buy again but would not pay $50 but i wouldnt pay that for any pillow on the market. These pillows are the ONLY ones I buy! I have cervical fusion and now 4 more herniated discs. I have been living with pain for a long time. I cannot find any pillow that gives me relief and support as the Bamboo brand...BRAVO and thank you! It&apos;s really a nice pillow, high quality, better than I expected. It is very heavy and a bit firmer than I would&apos;ve expected. Flipping on its side and smashing it down for a softer experience is nice but still pretty stiff. I didn&apos;t notice any odor as mentioned in a previous review. I&apos;m prone to migraines so I&apos;m very sensitive to smells. It doesn&apos;t stay as cool as I was hoping but still better than every other pillow I&apos;ve used. I have only had this for a couple of weeks now. It was a Christmas gift but so far I think I would purchase another one. Pillow is great. My hubby tried to take it. Would recomend it.Love it!! I have finally found the pillow of my dreams! After having tried the finest down-filled to the neck contour pillows (and many others) these pillows really live up to all my expectations. I really like how they automatically contour to your every movement. I am a VERY satisfied consumer. They are definitely 5*. Is great to sleep, it does not get hot, it doe not loose the shape..... Great investment. I have had many pillows in the past two years. I like an extra,extra firm pillow and this Bamboo pillow fits the bill. I absolutely love it!! The best purchase I ever made. I would definitely recommend this to anyone! this pillow cured my neck ache from pillows, I wake up with no neck ache. Love it. We switched from the My Pillow to the Miracle Bamboo Pillow. It&apos;s softer and more comfortable. I had bought one of these pillows for myself at Walmart last year and I just love it! So, I was so excited when I seen that New Easy had them, so I could get one for my husband. I hate going to the store for anything, so this saved my time and aggravation. Love the pillows. Just got queen instead of king. I am a very busy person and have asthma. I usually have to sleep at an incline due to vertigo and this allow me to get a least 4-5 hours of decent rest. Great investment for getting some type of rest. This pillow is great for back sleepers. It is also great for propping up to watch tv or read a book. The problem I have with it is it starts off super fluffy but quickly becomes hard. I find myself constantly punching it to make a place for my head. It is impossible to sleep on your stomach with this pillow, too high and it creeps up around my face. The side works for a few minutes but again, it creeps around my face. After a week of use, my neck has cramps every morning. My husband uses it and his snoring is worse than before.